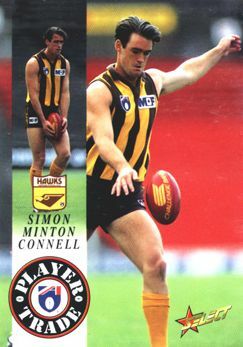 'Minty' was a surprise pick-up from Sydney in a trade for pick 87 in 1994. A full-forward, he was mainly used as a backup for Jason Dunstall, but the two never really worked together effectively and he was eventually traded to the Bulldogs for pick 29 (Nathan Turvey) at the end of 1996. Simon was quick on a lead but struggled in a pack situation. The cousin of Paul Hudson, the definite highlight of his career at Glenferrie came in Round 13 1995 when he kicked eight goals in a 99-point rout of Fitzroy. Minton-Connell could only manage three games and two goals in 1996. He was a surprise inclusion for his cousin in the Elimination Final against Sydney, but he failed to kick a goal.